As a nonprofit organization, fundraising is a key component to keeping Brown Play School vibrant and viable. Our supplemental fundraising efforts help us keep tuition costs in check, fund important improvements to our classrooms and grounds, and subsidize salary and benefits packages for our amazing staff. All families are asked to volunteer time and effort for one of our key fundraising events each year: the Fall Fete & Auction or the Run to Mama road race. Other fundraising initiatives are ongoing throughout the year. 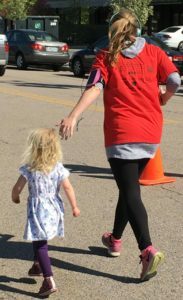 Each spring our “Run to Mama” 5K winds through the streets of Rumford. The race is followed by outdoor family fun, including carnival-style arts & crafts projects, gift basket raffles, and the Kids Fun Run. This year’s race will be on Sunday, May 19th, at 9:00 AM. 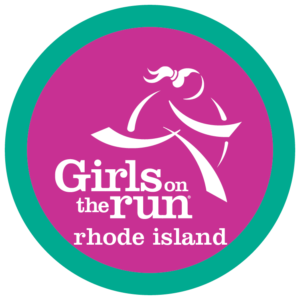 To register to run or donate to the event, use the button below. 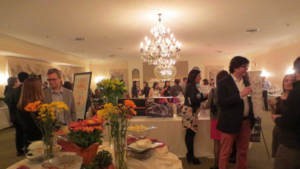 The annual “Fall Fete” wine and cheese cocktail party is our premier fundraising event. It includes live music, raffles, wine bottle surprises, an extensive silent auction, and a live auction for artwork created by the children of Brown Play School. Below are the donors who featured items at our 2018 auction. We thank them for their generous support and encourage you to patronize their businesses. When you first visit smile.amazon.com, select Brown Play School as your charitable organization. You can use your existing Amazon account, and 0.5% of the cost of all your purchases will subsequently be donated to the school. The Eastside Marketplace Friendship Fund is a receipt/rebate program that benefits Brown Play School (as well as other local nonprofit groups). If you shop at Eastside Marketplace on Pitman Street in Providence, save your receipts and turn them in to the school. 1% of the total purchase on those receipts will be donated to the school.